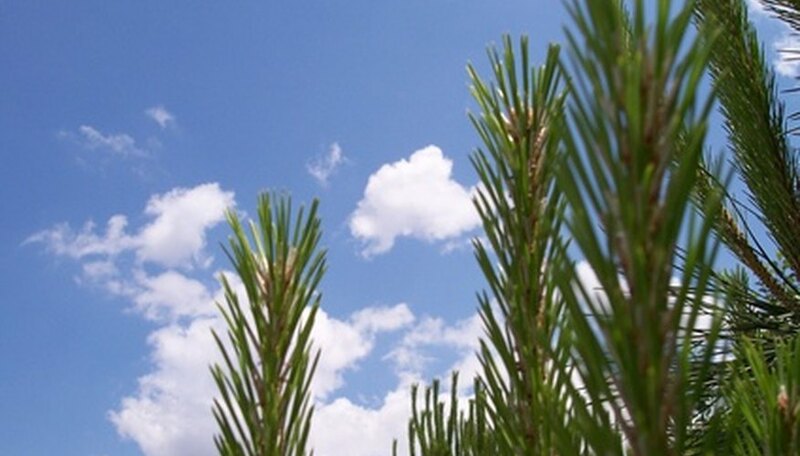 Pine trees come from the nursery or supplier in pots filled with soil or bare-root. When the seedlings are shipped bare-root, the root ball is packed with peat moss or other moisture retentive organic material and then wrapped tightly in cloth or plastic. Keep the soil around potted pine tree seedlings damp and cool until you are ready to plant. If the seedlings come bare-root, unwrap the root ball and moisten the organic material packed around the root ball. Plant the seedlings in the late winter or early spring when the young trees are in their dormancy period. Dig the planting hole slightly larger then the nursery pot for potted trees. When digging a planting hole for bare-root seedlings, dig the hole wide enough so that you can spread out the roots before filling in the soil. Plant both bare-root and potted pine trees deep enough so that the place where the roots and the trunk join is 4 inches below the surrounding soil level. Remove potted seedlings from the nursery pots. To do this, turn the pot on its side and, grasping the base of the trunk, wiggle the root ball free from the pot. Unwrap the material around bare-root seedlings and shake off the organic medium the roots are packed in. Place the root ball into the soil and fill in around the roots, patting it down as you go. Push the soil under and around the roots to get rid of air pockets in the soil. Water the seedling until the soil is damp to the base of the planting hole. Pat down the disturbed soil around the trunk. Use your foot to press down the soil, making sure the tree is firmly in the ground. Give it a light tug, if it pops out, press down the soil more firmly around the roots. If you cannot plant the seedlings right away, keep the roots damp. Place the seedlings in a shaded, wind-protected area until you are ready to plant.